For Jenifer, there is nothing more rewarding than helping patients heal from their injuries. 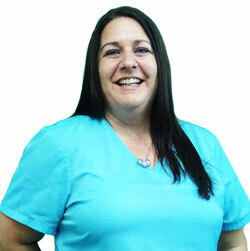 Since 2000, she has worked for Baywest Health & Rehab, LLC and loves the family atmosphere. It’s been a highly rewarding experience for her. Jenifer graduated from the Humanities Center School of Massage with an LMT/RCA and has been a Licensed Massage Therapist since 1997. She has worked in every area of the practice. The self-described “Jack of all trades” handles patient care, case management, attorney relations, licensing, background renewals and more. When she’s not working, Jenifer enjoys spending quality time with family and friends. Nothing makes her happier than being with the ones she loves most. She also loves nature and particularly enjoys camping, going to beach, kayaking, swimming in the springs and having cookouts with good friends. Contact our office today to book an appointment!